It runs until May 12 at GIG. (SPOT.ph) Now that we live in the era of DIY budget trips and cheap airfares, traveling has become an obsession for almost everyone—and rightly so! Breaking away from our daily routines from time to time can be beneficial, as it allows us to think of what really matters most in our lives. 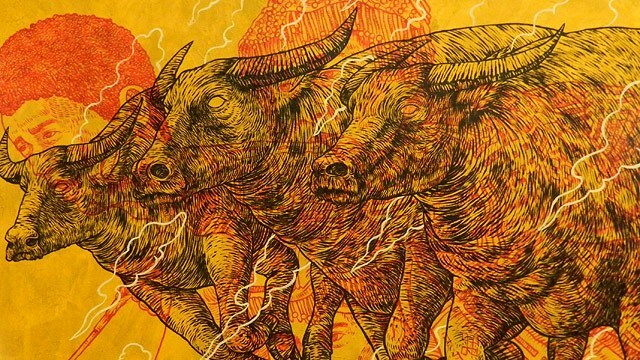 This is exactly what Antipolo-based artist John Paul “Japs” Antido had in mind for his solo exhibition titled This Land of Mine at Gallery in the Gutter in Makati. It interprets destinations that the artist has been to and those familiar to him as dream-like paintings. 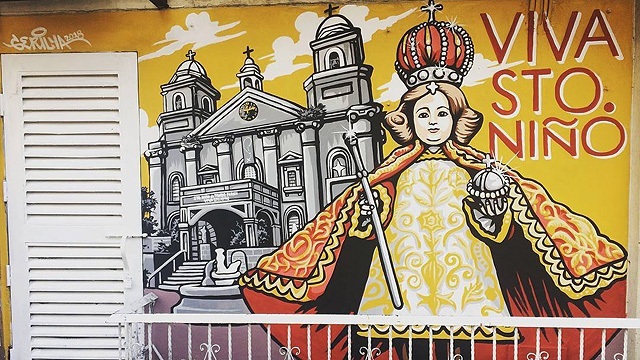 Large canvases filled with Antido’s interpretation of his experience as a traveler surround the quaint and elegant gallery, located in the middle of the busy Legazpi Village district. 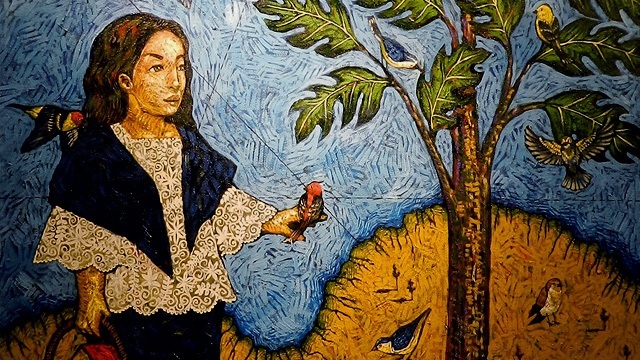 Established in 2017 by art collector Elizabeth Lietz, Gallery in the Gutter or simply GIG aims to showcase emerging artists in an artistic space where ideas can be nourished and then come into fruition through shows—as is the case with Antido’s current exhibit, a magnificent portrayal of travel destinations that are loosely based on actual places. The people in Antido’s works are usually dressed in traditional clothing and portrayed with antique objects. In “Dead End or Not,” two men wearing Barong Tagalog are on a tandem bicycle while paper planes fly in the air. It invokes both feelings of calmness and awe for the most basic form of transportation. 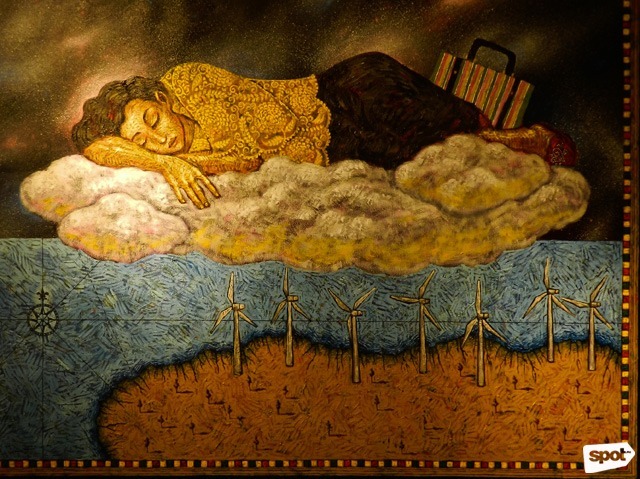 Meanwhile, a woman in baro’t saya sleeps on top of a cloud while windmills stand below. “This Land of Mine” illustrates what our own travel photos and selfies are unable to do—which is to recreate the magic of walking in an unfamiliar territory and dream about the next place to conquer. Hinting at magic realism, Antido’s subjects may appear human-like but there’s always something strange about the rest of the image. This theme complements his use of the impasto technique (heavy and thick brushstrokes like Vincent Van Gogh’s) to create texture, heighten the other senses, and imply feelings of nostalgia about a certain place. 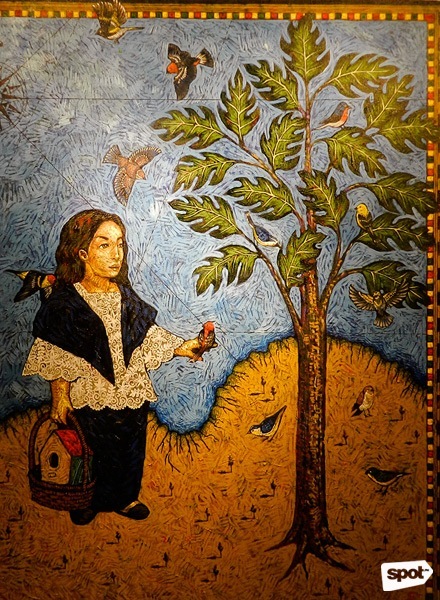 For example, a piece entitled “Little Paz” shows a woman holding a bird on her hand while standing next to a tree that looks like it's just about her own size. The woman’s face appears larger than the rest of her body, and her figure is not proportional to her legs and feet. Perhaps, this is Antido’s way of creating the memories of his travel back to life through his works: While they may be real situations, the fact remains that they now linger only in his imagination. Not everyone is gifted with the skills and talent that Antido brings to his paintings, but we can always learn about finding the magic in our travels through his works. Dreaming about faraway lands sounds like exactly what we need right now, especially in this summer heat. This Land of Mine runs until May 12 at the GIG, Eurovilla 1, Legazpi Street, Legazpi Village, Makati. For more information, follow GIG on Facebook.